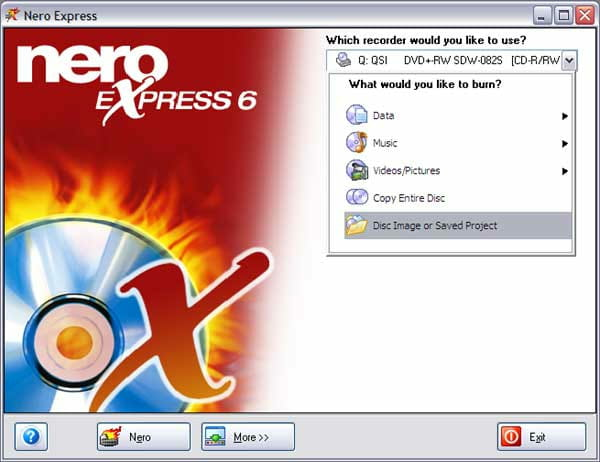 CD burning software like Nero are used widely to burn and write DVDs for storing, sharing or copying data across discs. Most burning softwares usually support ISO-9660 format which unfortunately makes it impossible to burn files over 2GB in size. The solution to this problem lies in selecting the UDF mode. The latter mode is recognized directly in most of the operating systems. Sometimes software like Nero may burn files over 2 GB in size but the resultant disc may not be recognized in many systems as the process may not have met the minimum standard. When you burn a DVD, it's usually the ISO-9660 format which is used (either in Nero or other burning software). The ISO-9660 format doesn't support files which are more than 2GB. To burn a file which is more than 2GB, use the UDF mode. (In UDF mode, the maximal size of a file is from 18 446 744 709 551 616 bytes). The UDF format is readable directly in some O.S. (Except for Windows 95/98/ME and MACOS which will need a driver. Note that the ISO format has other extensions (file Limit (65535), on maximum number of files per directory, on the length of file paths, etc. )...when in doubt, use the UDF. Some software (like Nero) can burn CDs/DVDs type ISO-9660 but do not meet the standard. This is not recommended because these CDs/DVDs will be unreadable in many systems. Some limitations of the ISO-9660 format can be circumvented without simply using UDF or Joliet RockRidge. These are extensions to ISO that allow (among others) to use long file names. But they cannot overcome the limit of 2GB. Published by jak58. Latest update on November 8, 2012 at 11:29 AM by Jean-François Pillou. This document, titled "Unable to burn files over 2GB," is available under the Creative Commons license. Any copy, reuse, or modification of the content should be sufficiently credited to CCM (https://ccm.net/).